(Hong Kong – 10 January 2012) Ocean Park today kicked off its year-long celebration of 35 years of happy memories. At a giant party marking Ocean Park’s 35th birthday, Dr. Allan Zeman, Chairman of Ocean Park, announced a bundle of good news, starting from the fact that the Park welcomed nearly 7 million guests in the calendar year of 2011 (January to December 2011). It was also announced that the Park recently welcomed the first-ever Park-born marmoset into its family of animal ambassadors. As well, Dr. Zeman revealed the design concept of Old Hong Kong – a new attraction slated to open in the first quarter of this year – and members of the media were treated to an exclusive preview tour of the attraction. In reciprocation of the community’s loyal support, the home-grown world-class theme park is offering 35% daytime admission discount from now till 9 April 2012 to guests whose Hong Kong Identity Card number has a “3” immediately followed by a “5”, and 10% daytime admission discount for those whose card number has either a “3” and/or a “5”. Videotaped congratulatory messages from Chief Executive Donald Tsang, senior government officials, members of Legislative Council, international film star Andy Lau and other celebrities were shown at today’s celebratory event, highlighting the significance of the occasion for the entire community. As guests of honour, Mr. Stephen Lam Sui-lung, GBS, JP, Chief Secretary for Administration, presented a particularly meaningful gift for Ocean Park - a giant birthday card featuring pictures from the grand opening of Ocean Park in 1977 and today’s Ocean Park, showing how Ocean Park has flourished as a key landmark of Hong Kong. Among other honoured guests at today’s celebration were: Mr. Winfried Engelbrecht-Bresges, Chief Executive Officer of the Hong Kong Jockey Club; Ms. Judy Chen, Chair of Ocean Park Conservation Foundation, Hong Kong; Legislative Council member Mr. Fred Li Wah-ming; renowned adventurer Dr. Rebecca Lee; Ms. Victoria Lam, Chairman of Joyful (Mental Health) Foundation and Mr. Kevin Wong, Managing Director of Kee Wah Bakery. On behalf of Kee Wah Bakery, Mr. Wong presented a specially designed traditional Chinese New Year Cake – the largest ever in Hong Kong – to Ocean Park for its 35th birthday. The giant cake is composed of 350 mini rice cake and weighs 200 kilogrammes. As well, Ocean Park has a new member to its family of animal ambassadors – a marmoset cub born in December 2011. The birth was a welcome event not only because the cub was the very first marmoset born in Ocean Park, but also because the marmoset parents were able to reproduce naturally a mere few months into their residence in the Rainforest attraction since mid-2011 – a clear sign that Park staff has created a comfortable home for them. Ocean Park opened its doors for the very first time on 10 January 1977, offering the people of Hong Kong an educational and recreational facility with 12 attractions, including its iconic cable car ride. The Park welcomed 1.3 million guests, composed entirely of local residents, during its first year of operation. Over the course of 35 years, Ocean Park has grown to become a world-class theme park with nearly 70 attractions. It has also established itself as a major pillar of Hong Kong’s tourism industry, with visitors from outside Hong Kong accounting for 65% of the nearly 7 million guests welcomed in the calendar year 2011. 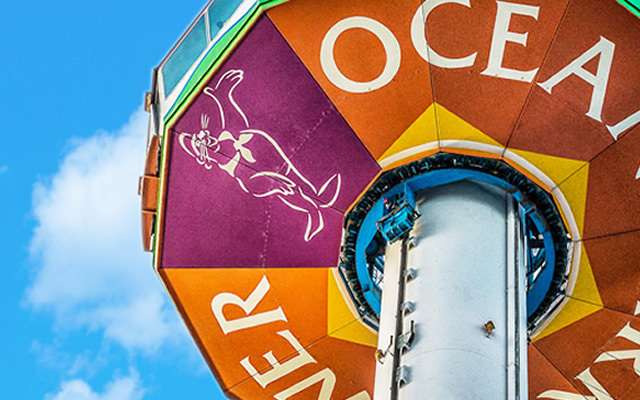 Since its opening in 1977, Ocean Park has provided edutainment to over 100 million guests. As the Park’s offerings and popularity grew, staff size expanded from 300 in 1977 to 2,100 in 2011. At the heart of Ocean Park’s success is its excellence in animal care and husbandry. Thriving under an excellent level of care, one dolphin and nine macaws have grown up with Ocean Park since its opening and now bear witness to the Park’s continuing success 35 years later. Ocean Park is also home to the world’s second oldest giant panda, Jia Jia, who is looking forward to her 35th birthday later this year.